Contingencies & Champions. The world road champs were held in Australia for the first time ever, and by lucky happenstance we had an Australian defending: champion going into the race (Cadel Evans), and an Australian bronze medallist coming out of the race (Allan “Alby” Davis). The build-up had been quite low key until the Friday, when we left from Canberra for Melbourne where the race would start. 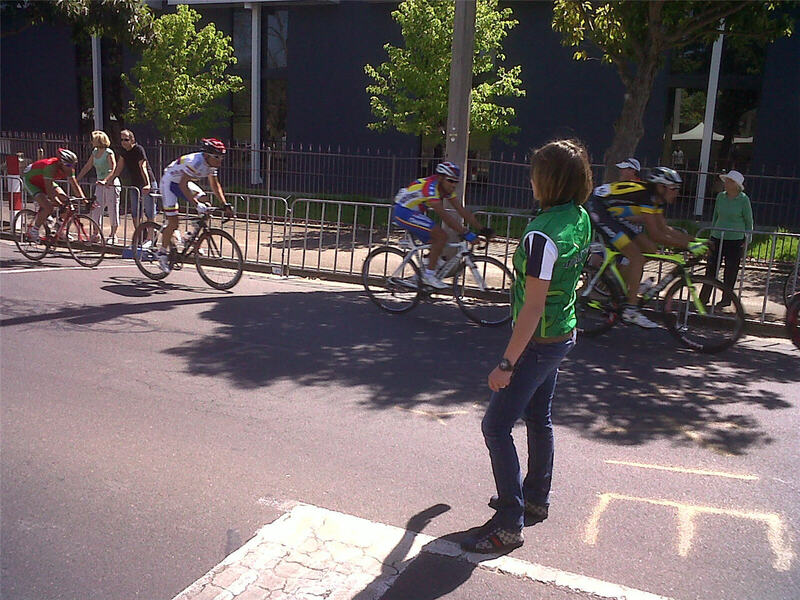 Cadel’s last ride in stripes. We hit Melbourne and were staying in a very central hotel, which was perfect for the start of the race, except for one thing… The Aussie Rules grand final replay happened on Saturday, and we were situated right next to where the final was held, above the nearest pub to the stadium! Good grief. The downside was that we suffered a lot of drunken Aussie Rules fans storming up and down the streets around our hotel bellowing out their war cries and cheers for the big game. The upside was that the boys were invited to the game to be presented to the crowd at half time of the game! 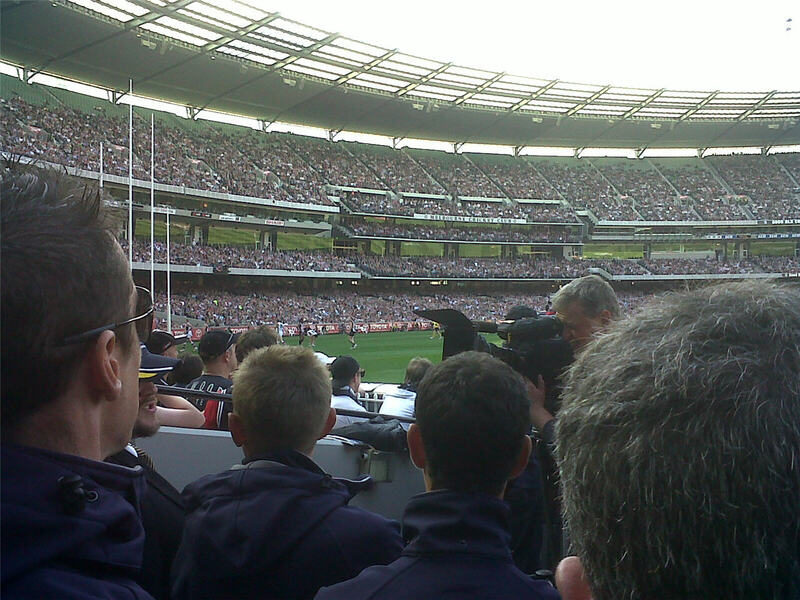 The MCG (the stadium where the Aussie Rules was) is a spectacular stadium, and being there for the Aussie Rules grand final is invariably on the lifetime list of “Things you must do” for any Australian sports fan. I am very happy to say that all of the staff were allowed to head in to the stadium with the riders to soak up the atmosphere, take some photos, and just enjoy the scene. Matty Hayman & Alby Davis at the MCG. Cadel and Stuie O’Grady were both interviewed in front of the crowd of over 93000 people, and I can’t imagine many better ways to be inspired for a big race the following day. The race day for us started at silly o’clock as daylight savings kicked in overnight, giving us an extra thwack of pain, but the excitement of being on another race easily overcame all of those worries. We had to prepare for two feedzones on the circuit itself, with eleven laps going through, meaning we needed double the normal amount of material to give to the boys as they rolled around. Being a home race, we had no problems with staffing the various areas that were needed, meaning we could head straight to the feed prior to the race even kicking off. Once the race was underway, the tension started to build, with the crowd increasing in numbers, and the reports starting to filter through as to how the race was looking. An early break took a lot of time on the main bunch, and it was hilarious to see people starting to calculate if they could possibly take a lap out of the whole field prior to the big hitters getting their skates on. Fortunately it never happened, so we won’t know what the response from the UCI would have been, but I couldn’t imagine how they would justify pulling all but five riders off of the course as the front five had gotten too far ahead of them. The relief from the commissaires as the bunch hit the circuit without being lapped was clearly visible! Good to keep them on their toes I reckon. The interesting thing about the Worlds is that there are so many teams involved in the race, the feed zones can turn into brothels they are that hectic. We had a good plan where I would just go as far up the road as was required to be one of the last teams there. Thus the boys would easily be able to spot me, and could rely on getting a drink every lap. It was a lot of walking for me, but it was fun chatting to the locals as I toted drinks and food back and forth. The crowd around the spot where I was handing out bottles was hilarious, and typically Australian — they had a table of sunscreens on offer for all to use, offered me beers on the first lap, asked me to carry cigarettes to their friends across the course and generally treated it like the great day out that it was. By the end of the race when they had put down quite a few drinks and were clearly having a ball, I could only shake my head as they started slow chanting my name as I walked to the spot from about lap 5: I had 6 more laps of escalation to deal with! They would cheer every bottle given to the boys, and generally had an absolute ball. It was a cool addition to the day. The racing itself was extremely hard, as can be expected from the world champs. My first two laps were spent trying to break myself of the habit of finding the Garmin-Transitions boys and giving them bottles — there were a lot of lads from the team there, and their helmets are very easy to spot, so I was constantly finding my eyes tracking away from looking for the green and gold jerseys, but sorted myself out quickly enough. The splits started appearing after three or four laps, and the race started going gangbusters, with Simon “Gerro” Gerrans, Stuie and Cadel jumping in the first major split, which the Spaniards eventually shut down, despite a lot of work from Gerro to hold them at bay. Then things were confused, with various big names taking their swings, and every single time, their moves were covered by Cadel. It was an epic performance by him, and his defence of the rainbow jersey was truly magnificent. The final two laps saw our hopes down to just Alby Davis and Cadel, with all of the other boys having done their bit to protect our team leaders, and cover the moves that were dangerous to our hopes of a result. Cadel was once again off the front, chasing down an enormous push by pre-race favourite Phillipe Gilbert, whilst Alby was in the group that was looking to pull things back together to set up a sprint. The boys shooting off the front were hampered by a strong headwind for the final few kilometres heading to the line, and so the larger bunch (by now down to only 20 or 30 riders) did haul them in. We were not allowed to feed for the final lap (as if anyone would want a drink with 5km to go anyway!) but we all remained where we were and nearly tore our throats out cheering for the boys to get going. One of our staff, Brian Stephens, had been working the whiteboard all day letting the boys know the situation of the race, and his final message was just “Yours to win.” We were all extremely proud of the final result, with Alby taking the bronze medal. As an added bonus, Thor Hushovd is a very good bloke from all accounts, and is headed to Garmin-Cervelo next year, meaning the team will have the bands for 2011, which is very exciting. Worlds was a very different race, and the boys are still trying to recover from it to be ready for the Commonwealth Games in a: week or so. It was very cool to be part of the Australian team, although I will admit that the last drink I gave out on the day was to Tyler Farrar, who rode through to finish despite being unable to stay with the leaders on the steep pitches on the back side of the course. ‘Bling’ Matthews in his new bands going training. The Aussies topped the medal tally, taking a gold with “Bling” Matthews (U/23 road race), a silver with Luke Durbridge (U/23: time trial) and the bronze with Alby. A great end to the season! Who’s already hanging out to see what happens next year? Next articleThe Namen Round of the GVA Series – 13th!